…it sure beats a movie. There are a few things I want to discuss in this entry, as the topic of popcorn, surprisingly, brings up a few important health issues. The first thing I want to talk about is microwaving, which is the method most of us use to make popcorn, unless we’re at the movies. Throughout its 40-year history as a commercial product, the microwave oven has been steeped in controversy. Personally, I don’t use one. 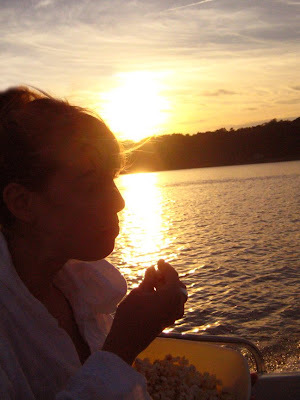 I feel that it goes against everything I stand for when it comes to my food: eating on the run, rushing through cooking and food preparation, the lack of interest in healthy foods and in the meal itself as an “occasion”. And after studying holistic nutrition, I learned a lot more about how microwaving alters the structure of the food being cooked in a completely unnatural way. I may discuss this in greater detail in another post, but I would encourage you to do your own research on microwave ovens. I have found that the best way to make popcorn at home is air popping. You can pick up an air popper at almost any second-hand store (trust me, I’ve picked up many for friend and family) for about five dollars. Instead of using cups and cups of oil, which is the traditional way to make popcorn, air popping uses hot air to convert water inside the raw corn kernel to steam. When the pressure from the steam becomes too great, the outer hull explodes and the result is a fluffy, healthy treat. Air popping adds no fat, and when you buy your own raw kernels you won’t be consuming any chemicals, artificial flavors or colours. Frighteningly, the buttery taste that often adds flavor to our favorite microwave popcorn brands is linked with a serious lung disease called bronchiolitis obliterans. A component of artificial butter flavor is the chemical diacetyl. It is used for aroma and taste in butter, some cheeses and snack and bakery products. In tests at NIOSH (The National Institute for Occupational Safety and Health), laboratory rats that breathed high concentrations of vapors from butter flavoring, including diacetyl, developed significant airway damage. In addition, it is wise to buy organic raw kernels if possible, as corn is one of the most genetically modified foods in North America. You can buy organic corn in the bulk section of health food stores and it’s actually cheaper than buying the over-packaged stuff in the bags. 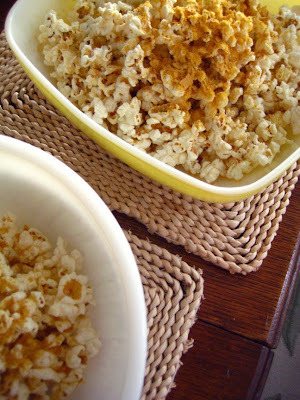 Since air-popped popcorn is rather bland, I love adding flavor with nutritional yeast. This is yet another wonderful food to pick up in the bulk section of a health food store! Nutritional yeast, similar to brewer’s yeast, is a nutritional supplement that can be used as an ingredient in recipes or simply as a condiment. It is a deactivated yeast, produced by culturing the yeast with a mixture of sugarcane and beet molasses, then harvesting, washing, drying and packaging it. It is commercially available in the form of flakes, or as a yellow powder similar in texture to cornmeal (pictured on popcorn above). It is popular with vegans and vegetarians since it is a source of protein and vitamins, especially the B-complex vitamins. It is also naturally low in fat and sodium. Some brands of nutritional yeast, though not all, are fortified with vitamin B12. The vitamin B12 is produced separately from bacteria and then added to the yeast. Nutritional yeast has a flavor that is described as nutty, cheesy, or creamy, which makes it popular as an ingredient in cheese substitutes. It makes salad dressings smooth and rich, and tops whole grain pasta in place of parmesan. When I began writing this post, I did not expect that a little bowl of popcorn could raise so many issues, but I hope that I have given you some ideas on how to eat this delicious snack more responsibly!